For the ones not aware of the website developed in the name of Rajinikanth by his fans, the website runs without Internet connection. Sounds crazy? Read on. Always Rajini’s style and stunts are unique and also after the popularity of his role as a robot, Rajinikanth became very popular in jokes and impossible things. To that account Rajini’s fans have developed and dedicated website in the name of their popular star ‘Rajinikanth’ which depicts his life and career. Obviously, to give Rajini touch – the website works only when internet is not connected. The design of the website is wonderful and it is the first of its kind. Looking at the technical details of the website, we can easily make out it is designed using Flash. Upon opening the website a temporary folder containing flash pages will be stored into the computer memory. When the internet is disconnected, the pages will be in the memory of local machine (or the user machine) and won’t be fetched from the internet. Coming to the internet connection, the web page opened will be pinging to some server at the back end, if any data packets are received then it display the internet is connected to system otherwise no such messages and we can access to all the contents. The design is such that pinging process will be done continuously so that if any arrival of data packets is identified, immediately the above mentioned message displays informing internet is connected! Rajini is always popular giving shocks to his fans. Now, his fans only gave him shock developing a website running on Rajini power. Being in academics gives some experience of conducting or doing invigilation in examination on a regular basis. Also invigilating for three hours in the exam hall is like a punishment – this is one side of the coin. The other side of coin is the paper evaluation, reading whatever students have written. I need not tell explicitly that students will write whatever comes to their mind than what is required or asked in the examination. Even though am not allowed to do evaluation of semester examination answer scripts, being a junior in the department need to help all the senior colleagues in counting total marks, filling the OMR sheets etc., On one of such occasions it so happened that one answer sheet had a small bundle of papers. Immediately we recognized it as the micro copy which student might have used for copying in the examination. Copying or carrying any text material in paper can be treated as malpractice and the punishment can be imposed even to the extent debarring student from taking examination for certain years. The student has made sure that all the pages in the book were properly scaled down to the small rectangular book to be able to hold in the pocket or hide in the answer booklet so that it won’t be visible to others. Don’t know why the student has left the chit in the answer booklet itself, as many students will copy in the examination without the notice of room supervisors and external observers and won’t be caught even after copying successfully! Many students planning to copy or to recall answers while writing scribble some code words or small letters as hint on their geometry box, scribbling pad and worse is that students won’t mind writing on the back side of identity card issued by the institute. Even few students find out their seating arrangement in the exam hall in advance and paste the text book material or write down important points on the desk they sit. These are just the ways I noticed there may be many ways left to the innovation of students as one of the girl recently caught during exam has neatly scribbled important formulae on six pencils just by skinning those! 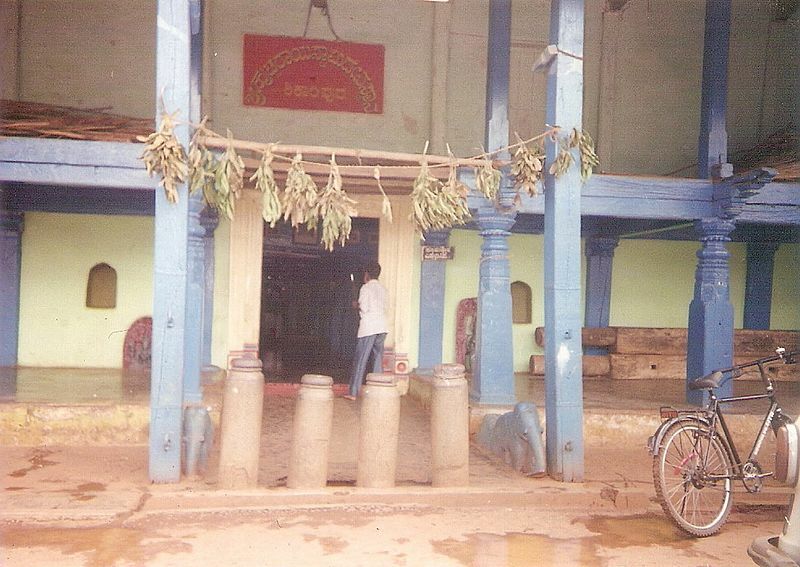 Modernization has not left the temples also. The old architectures built using stone and mud are now replaced by the concrete structures. The ancient beauty of temple is gone and it looks like the commercial complex than the temple. 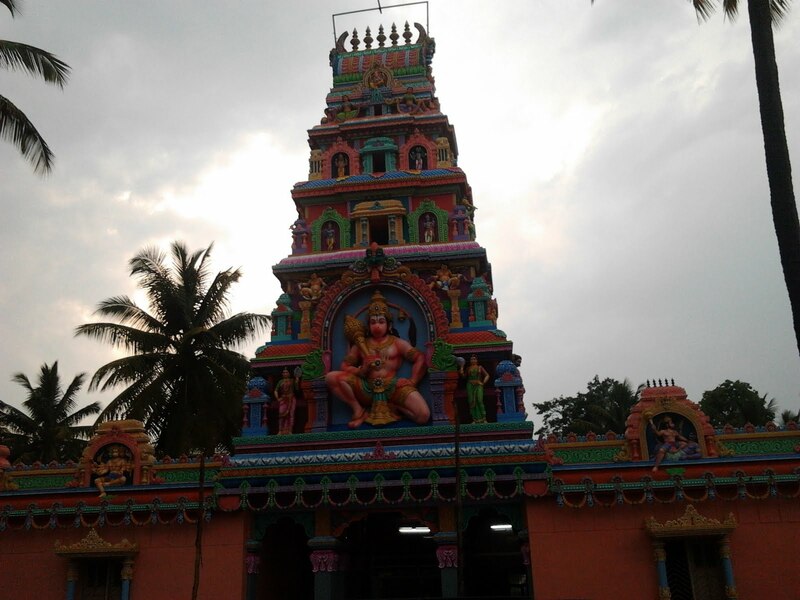 The ancient temple of Sri Anjaneya Swami has been rebuilt at Shikaripura. 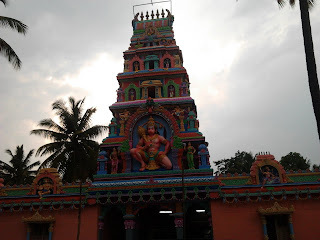 I got the old photo of the temple while searching something on Wikipedia, I readily remembered the childhood days when I used to play in the temple premises sitting on the stone elephants placed near the entrance of the temple. Now, everything is gone except the marble floor at the entrance.